Joe Jackson and his band at The Cutting Room. To say that hosting Joe Jackson’s recent FUV Live performance at New York's Cutting Room was an honor is an understatement. I’ve been a music junkie for as long as I can remember. Growing up in the 1970s, artists like Wings, George Harrison, Steely Dan, Chicago, Jefferson Starship, Styx, the Steve Miller Band, Peter Frampton, Al Stewart, Fleetwood Mac, and the Doobie Brothers provided me with the soundtrack to my youth. By the late ‘70s, I started looking for something more. I ventured away from my favorite positions on the FM dial and landed on 102.7FM, WNEW-FM, featuring an evening DJ named Dennis Elsas! No one in the eighth grade at St. Clare’s School in the Bronx were listening to them and that appealed to me. One day, in early 1979, I heard a song by this new artist from England named Joe Jackson. I was floored. I can’t remember if it was “Is She Really Going Out With Him?” or “Sunday Papers.” I’d never heard anyone that sounded like him. The energy and the emotion in his music resonated in my young mind. I immediately bought his album Look Sharp! and listened to it constantly. The album rocked with an attitude that I totally related to, yet it was the ballads that packed the hardest punch. Joe’s band performed with an in-your-face aggression that was infectious and, man, did I love the bass playing of Graham Maby! Look Sharp! lived on my turntable during the summer of 1979. During the first months of my freshman year at Salesian High School in New Rochelle, came a second album from Jackson, I’m The Man. Damn! He did it again. I’m The Man was as good, if not better, than Look Sharp! and I wore my Jackson allegiance like a badge of honor. In the fall of 1980 came the third album, Beat Crazy. As I grew up and my tastes widened and matured, the scope of Jackson’s music expanded. Although my 16-year-old ears weren’t quite ready for the foray towards the jump blues and '40s-era swing on 1982's Jumpin’ Jive, his album Night And Day, with its Cole Porter-esque look at a couple’s day in New York City, became a favorite for me and my first girlfriend. She always thought my affinity for the song “Breaking Us In Two” was my message to her. It wasn’t. I just loved the song. In the fall of 1983, Fordham University and, perhaps more importantly, WFUV became my home. I was so excited to be able to spin Jackson’s new albums like the Mike’s Murder soundtrack, Body And Soul, and Big World on the radio. In fact, my first Joe Jackson concert was during the 1986 Big World tour at Radio City Music Hall. I’ve remained a passionate Joe Jackson fan and aficionado throughout the years and all of his musical twists and turn: his ventures into modern day classical and opera (Will Power, Night Music, Heaven & Hell, Symphony No. 1), his pop offerings (Blaze Of Glory, Laughter & Lust, Rain), his updated look at life in New York (Night And Day II), the reunion of his original band (Volume 4, Afterlife Joe Jackson Band Live), his tribute to Duke Ellington (The Duke), a few more live albums, and now his brand new album, Fast Forward. Fast Forward is a collection of 16 songs, divided into four sections. Each section was recorded in a different locale: New York City, Amsterdam, Berlin and New Orleans. Each session featured a different collective of musicians, including guitarist Bill Frisell, drummer Brian Blade, bassist Graham Maby and violinist Regina Carter in New York, members of Galactic and saxophonist Donald Harrison Jr. in New Orleans and bassist Greg Cohen and Tindersticks drummer Earl Harvin in Berlin. For the Amsterdam session, Joe was accompanied by an orchestra. I was thrilled to talk with Jackson at our FUV Live concert at the Cutting Room and to introduce him to an eager audience of FUV Marquee Members. 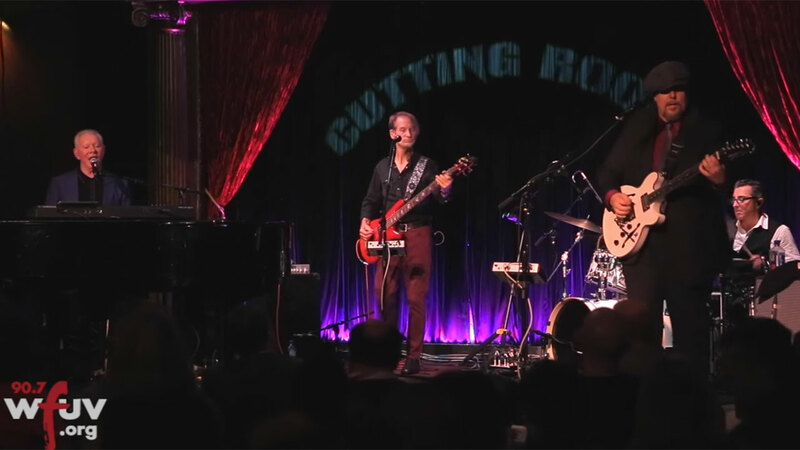 Jackson was joined on stage by longtime bassist and vocalist Graham Maby, guitarist and vocalist Teddy Kumpel, and drummer Doug Yowell. It has been 36 years since I first heard Jackson's music. Now, I was standing on the same stage. He’s still the man!